Six European countries had their ratings cut, but the EFSF's provisional rating was reaffirmed. 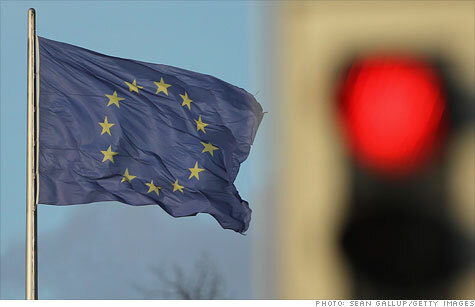 NEW YORK (CNNMoney) -- Moody's cut the credit ratings of six European countries on Monday amid continued anxiety over the continent's debt crisis and its sluggish economy. Italy, Malta, Portugal, Slovakia, Slovenia and Spain were all downgraded, while three other countries -- Austria, France and the United Kingdom -- had the outlook on their current Aaa ratings changed to "negative." Ratings for Italy and Spain now sit at A2 and A1, respectively, while Portugal is rated Ba2, all with negative outlooks. Moody's said in a statement that the main drivers of the ratings changes included "the euro area's prospects for institutional reform of its fiscal and economic framework" and "the resources that will be made available to deal with the crisis." The agency also cited fragile market confidence and Europe's "increasingly weak macroeconomic prospects." The move follows similar downgrades of European nations recently by fellow rating agencies Fitch and Standard & Poor's, and comes as investors are waiting to see whether euro-area finance ministers will approve the latest bailout for Greece this week. The Greek Parliament voted early Monday to approve a package of austerity reforms aimed at securing the bailout, worth €130 billion, from the European Union and the International Monetary Fund. Investors may be heartened by the fact that Moody's didn't downgrade the eurozone's bailout fund, the European Financial Stability Fund. Instead, the ratings agency affirmed its provisional Aaa long-term debt rating with a stable outlook.